From Mediaite: Stop-and-Frisk continues to make headlines. 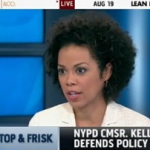 Mediaite reports on what MSNBC had to say: “Amy Holmes, former speechwriter for Senate Majority Leader Bill Frist (R-TN) and anchor of Real News on The Blaze TV, ripped New York City’s controversial ‘stop-question-and-frisk’ policy in an appearance with MSNBC’s Chris Jansing. Holmes said that she believes the policy is racially discriminatory because, in her wealthier and whiter Manhattan neighborhood, criminal behavior is practiced in the open without fear of police reprisal. Asked by Jansing about ‘the mistrust that develops between police and the citizens of any given city’ which results from policing strategies like ‘stop-and-frisk,’ Holmes said that she thinks this is a ‘huge problem. '” Read more here. From Gossip Cop: Prince George may only be a few weeks old, but he’s captivating the world. 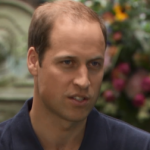 Gossip Cop reports on the latest, “Prince William sat down with CNN for his first in-depth interview since welcoming son George last month, revealing that the one-month-old future king is’a little bit of a rascal.’ ‘He either reminds me of my brother or me when I was younger, I’m not sure, but he’s doing very well at the moment,’ says William. He continues, ‘He’s a little fighter — he wriggles around quite a lot and he doesn’t want to go to sleep that much.’ William admits to feeling ‘shock’ when he and Kate Middleton debuted their newborn for the world outside St. Mary’s Hospital, ‘but I was on such a high anyway, and so was Catherine, about George that really we were happy to show him off.”” See video of the interview here. From Geekosystem: It took three centuries, but New Zealand has finally changed some outdated laws. Geekosystem explains, “Scrying the future just got a lot safer for New Zealand-based practitioners of the occult. The island nation has announced plans to repeal laws against fortune telling and ‘witchcraft’ in general which have been on the books since 1735 and could conceivably send modern day sorcerers to jail for up to a year — with some of that time spent in the stockades. 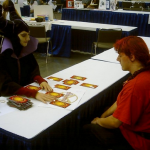 The Witchcraft Act of 1735 is just one of several antiquated laws due to be removed from the books as New Zealand does some spring cleaning to its legal system, ensuring things like ‘offering tarot card readings’ are no longer punishable by a year in prison featuring quarterly visits to the stocks, where onlookers could throw rotten fruit and vegetables at them with impunity.” Read on here. From Styleite: LiLo’s comeback continues on all fronts, with the latest a foray into fashion. Styleite writes, “We’ve been finding ourselves oddly transfixed by Lindsay Lohan’s tragically post-meta method acting in The Canyons, legitimately amused by her self-deprecating Chelsea Lately appearance, and feeling all the feels about her Lagerfeld-featuring comeback selfie. But now there’s a new Lohan thing to feel a weird mix of derisive and fascinated about: Her just-launched personal style blog. As part of her comeback the formerly booze and chaos-addicted actress has started blogging energetically at LindsayLohan.com. And hey, what do you know? Most of it is really, seriously quite awesome. She branches out from straight self-advertising with funny videos, and her use of the #nextchapter hashtag is really excellent. There is also a bona fine fashion section, and while haters gon’ hate, there are reasons to love this too.” See five reasons Styleite loves it here. From SportsGrid: Was last night the turning point for Alex Rodriguez? SportsGrid’s Eric Goldschein argues, “It’s been a weird couple of weeks for Alex Rodriguez. The extravagantly paid slugger is in the midst of appealing a 211-game ban while a dozen of his peers are already serving Biogenesis-related suspensions. He stands accused of not only taking performance-enhancing drugs, but possibly selling out a teammate to take the heat off his own back. His uneasy relationship with Yankees management has deteriorated to the point that he barely speaks with GM Brian Cashman, who said that they are in a “litigious environment” and that it was a distraction. Last night, during the Red Sox-Yankees game on ESPN, some wondered why A-Rod hasn’t simply been cut from the team to avoid all the headaches.” Read the piece here. From The Mary Sue: There’s news about The Twilight Zone movie. Writes The Mary Sue, “Last we heard of the Twilight Zone movie, Leonardo DiCaprio‘s production company Appian Way had been trying to make it happen for approximately forever-and-a-half. There was even avague, questionably accurate plot summary involving time travel. And now there’s even more progress, as producers DiCaprio and Jennifer Davisson Killoran have reportedly chosen whom they want to direct. So who’s going to be helming the triumphant comeback of this legendary, much-beloved sci-fi franchise? The guy who directed TRON: Legacy. Er. According to The Hollywood Reporter Joseph Kosinski is in talks to direct the film, which is currently being ‘redeveloped.’ So we might kiss that time travel plotline goodbye, assuming it was even a legit thing in the first place.” Read on here. From The Jane Dough: Not having a great start to Monday? These babies know how you feel, writes The Jane Dough: “In “Pucker,” photographers April Maciborka and David Wile have captured the visceral reactions of babies tasting lemon for the first time. After laughing for a solid three minutes and then coughing for two (clearly I have to stop smoking — I’m turning into the Tiny Tim of the office), I realized the images’ versatility. The toddlers’ expressions are like a party mix of negative emotions: pain, confusion, betrayal, and disgust have all conglomerated onto one tiny, chubby baby face, forming a single powerfully graphic signifier of “DO NOT WANT.” It’s like physiological version of the Power Rangers combining into the Megazord, amirite, guys?! Amirite?! 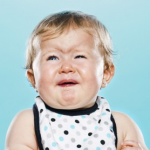 These grumpy babies could function as the perfect illustration of any adverse emotional reaction!” See the photos here. 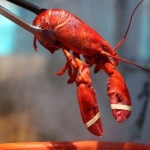 From The Braiser: Today, a special report on the economics of lobster from The Braiser: “If you’ve been following lobster news lately (and you should, since it is The Most Pressing Issue Of Our Time; whatever, Egypt), you’ll know that thanks to warmer waters, lobster populations have exploded in the past year, and the price for the sea bug’s hit a 20-year low. But why is it, The New Yorker wonders, that the legendary lobster glut — leading to legions of worried Maine lobstermen and New England supermarkets selling the pricey crustacean for $2.20 a pound — hasn’t led to cheaper lobster throughout America? Short answer: because restaurants can make a lot of money by convincing everyone that lobster is still Rich People Food.” Read on here.